It’s that time of year! Where I grab my buckets and a sweet hoe/rake combo that I acquired somewhere, and head out to the various apple trees I have met in the past ten years. I am much less zealous than I ever have been, because I have been brought down by too much fruit in the past. There’s just so many apples you can eat, you know? I just avert my gaze now when I see trees full with fruit that people are neglecting. All I make these days with apples is applesauce and lots of it. I wouldn’t make so much if it weren’t for my son, who loves it. This year I added some pears to my applesauce, and my son declared it the best applesauce I’ve ever made. (Honestly, I think he’s realized that complimenting my food makes me happy, so he does it a lot now, which is, of course, very charming.) It’s also a good thing to have on hand if you want to make this chocolate applesauce cake, because don’t you want to make that? I do! 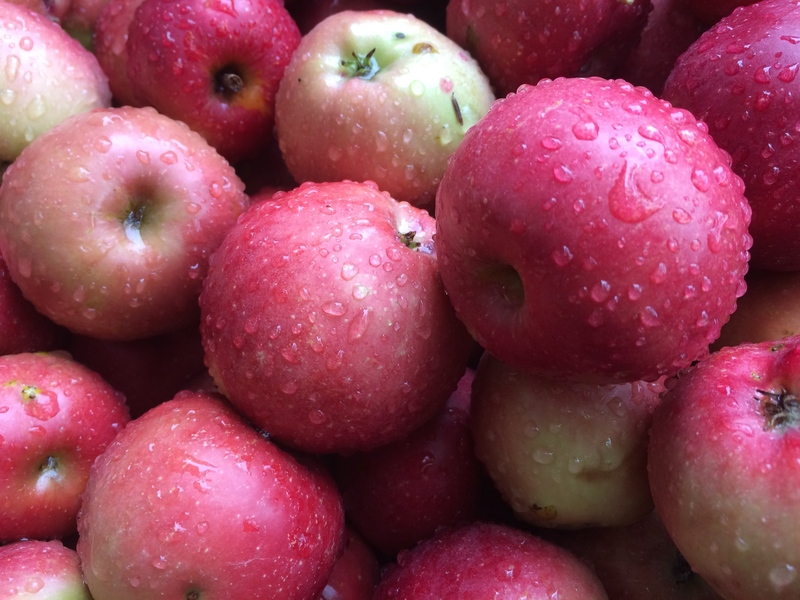 If you are setting out to make an apple pie, however, do you cook your apples first? I’ve always made apple pies with uncooked apples. Always. When I was a teenager I worked in a restaurant that did catering, and we made billions of pies. It’s how we did it there, and it was how I learned apple pie at my mother’s side. However, I think I may have just changed gears. The other day when my son turned seven, he requested an apple pie instead of cake. I had read about the precooked apple idea recently, I forget where, and thought: I should try that. More than not, I’m disappointed by a high risen top crust and a liquid-y apple mixture. It seems like it was always hit or miss. Always tasty, but somewhat aesthetically off, in my opinion. For those of you that can apple pie filling this time of year, you are probably shaking your head at me with pity. I never liked the idea of pre-made pie filling, but I really do see its benefits for throwing together a quick pie. It has just never been my thing. Maybe now I’ll change my ways. What I did this time was to gently sauté the apples in some butter and sugar, adding cornstarch at the end. I followed along with this recipe from the Times. It was probably the best apple pie I’ve ever made, and you know, I’ve made some pies in my life. What do you make with your apples? Brandied apple rings? Candied pickled apples? Apple tomato chutney? Apple vinegar? Apple pectin stock? Let me know! That sounds really good, Eve. Thanks for sharing it! I recently made some rhubarb chutney and I didn’t love it, so I’ll try this one next time. I actually still have rhubarb growing in my garden, amazingly. And well, if you get some quinces you HAVE to do something with it, don’t you? That membrillo you made looks great. These days I don’t make pies, cooked apples sounds like a good idea. What with my teeth, still waiting for 5 implants, I thought I’d make applesauce. WELL! THAT was the best applesauce I ever made and the FIRST. HAVE to make it again, but I’m not lucky like you to find apples. In my neighborhood, it’s mango time. From June on, I can go out and come back with ripe mangos in my neighborhood. I love that you can just waltz out and grab a mango as easily as I can grab an apple! Experimenting with apples myself this year. I normally peel and chop apples and freeze them for pies. This year it’s apple sauce for pancakes, apple spice cake and a breakfast cookie. Sounds great, Lisa! I just made a batch of applesauce muffins–so good. And you know, I rarely freeze apples for the house but they do freeze beautifully. Thanks! Making dried apple rings — many bags. Applesauce. Apple butter. Crabapple jelly and pickled crabapples light on the cinnamon and allspice. Going to try the NYT pre-cooked apple pie. I have to take the same approach with elderberries (ie pre-cooking) to get that level of control (the juicy/jelly body, the sweetness — not too much, the crust itself — I’ve got warm hands so it’s a challenge.) I’ve got ornamental quince juice (last winter’s cold half-killed our neighborhood quince tree) ready to go for jelly and may add some to my mix for apple jelly. Thanks for reading, David! That all sounds good. I think I should make some apple butter. You’re inspiring me. You make elderberry pie?? Wow! Quince is not ready yet for us, but soon!